The New Chanhassen Dinner Theatres is the largest professional dinner theatre in the country, and one of the best. It has recently come under new ownership, led by long-time Artistic Director Michael Brindisi, which is committed to making it successful as a business and a theatre. I've attended just about every show on the mainstage in the last five years or so; my sister lives nearby so it's a good excuse to go visit her. While there are some shows I like more than others, they always do a great job and have a talented core group of actors, singers, and dancers. I've recently realized that the Chanhassen is like the comfort food of musical theater. And that's not a bad thing, I love my mac & cheese (just had some on a stick at the MN State Fair today!). Like comfort food, a show at the Chan leaves you feeling warm, happy, and satisified. But there's usually nothing risky or edgy, nothing that will push the envelope of musical theater (see The Scottsboro Boys currently playing at the Guthrie). I believe there's a place for that, and I hope the new Chan is successful. Truthfully, All Shook Up is not one of my favorite shows I've seen at the Chan. It's a jukebox musical, which is not always a bad thing - my personal favorite is Jersey Boys, which has a great story in addition to all the great songs. Unfortunately the book of this show is not strong. It reminds me a lot of the last show at the Chan, Footloose (a bad boy, or "roustabout," comes to a town where dancing and fun is forbidden, and brings music back to town), with a little bit of Shakespeare's Twelfth Night thrown in (girl dresses up as a boy to get close to the boy she likes, mistaken identities and mayhem ensue). But on the plus side, the cast is great and there are some nice arrangements of all the old familiar Elvis songs everyone loves, and the cast fills them out beautifully. Rico Heisler is strong as the Elvis figure, Chad, and newcomer to the Chan Laura Rudolph, as Natalie, has a clear beautiful voice and good stage presence; I look forward to seeing more of her. Scene stealer Jay Albright plays Natalie's father Jim, and as usual, brings a little extra something to the role. He has the uncanny ability to break your heart and make you laugh at the same time! If Aimee K. Bryant (proprieter of the town hangout and Jim's love interest) was auditioning for the role of Motormouth Maybelle in next year's Hairspray, she won it in my book! Another scene stealer was Emily Rose Skinner as Miss Sandra, the woman every man falls in love with. The band was on stage which is always fun to see, and the dance numbers were fun and lively. 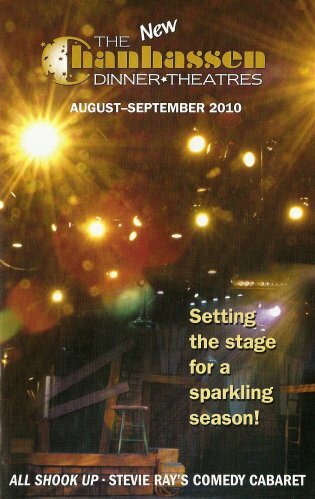 I'm looking forward to next year's shows at the Chanhassen - Jesus Christ Superstar (I recently saw a list of the top five rock musicals, and this was the only one I haven't seen, so I feel like I should! ), and Hairspray (one of the most infectious and happy musicals, with a little depth too). Also coming soon at the Fireside Theater is I Do, I Do, which in its previous incarnation ran for over 20 years. This production stars two Chan faves Keith Rice and Norah Long, so I hope to check that out too. So if you're looking for some good quality musical theater comfort food (and some actual comfort food too - dinner is served before the show and dessert at intermission), check out one of these shows at the Chanhassen.